In Oran (Algeria) when I was there a few days ago, political party posters were everywhere, advertising the recent local elections. Oran is nowhere near any major Berber-speaking region (though it has attracted a significant Kabyle Berber minority), and such posters – along with a few telecom ads – were almost the only publicly visible mark of Berber on its linguistic landscape. Their bilingualism is a token gesture towards the government's pious aspiration to make Tamazight (Berber) a national language, emanating from the centre rather than from the regions where it's actually spoken. Among these, the FLN posters in particular caught my attention. Right under the Arabic name of the party, they included a line in Tifinagh (the Berber “heritage” script) that I couldn’t make head or tail of: ⵔⴵⵏⵜⴷⴻ ⵉⴱⵔⴰⵜⵉⴵⵏ ⴰⵜⵉⴵⵏⴰⵍⴻ. 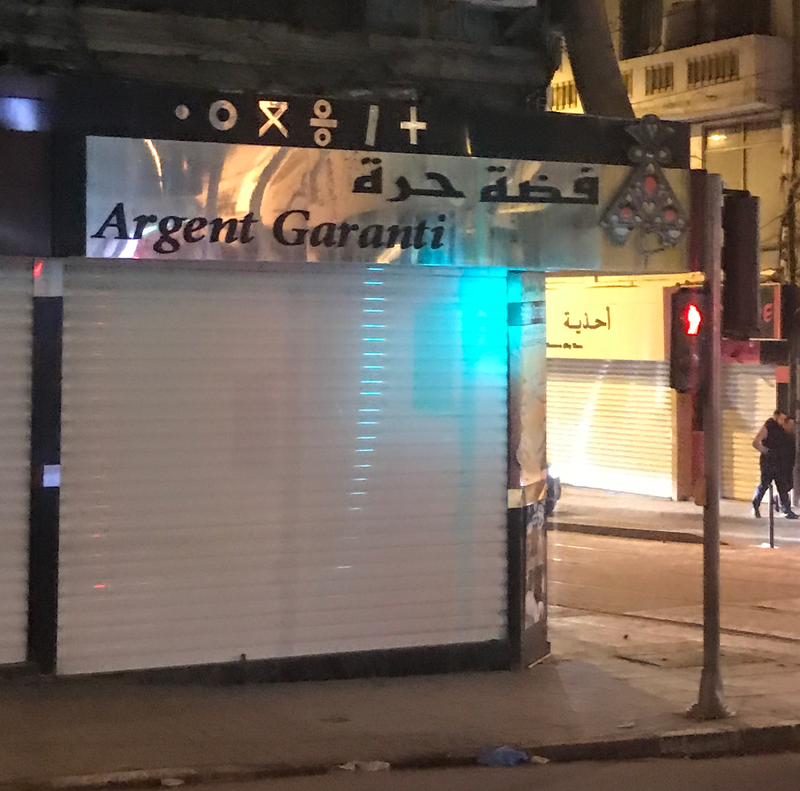 Transcribed, this reads rğntde ibratiğn atiğnale – which makes no sense; it’s not even possible in Berber to have e (schwa) at the end of a word. It wasn’t until I started looking at my pictures on the flight back that the penny dropped. Just substitute o for ğ, and you get rontde ibration ationale. Restoring the capital and accented letters (neither of which Tifinagh has), you get Front de Libération Nationale. When the order came from on high to add Tamazight to the poster, some supremely indifferent functionary in the local FLN office must have literally downloaded a Tifinagh keyboard, typed in the French name of the party, and stuck it on the poster. Most likely, this functionary was an Arabic speaker. In fairness, though, plenty of Kabyle speakers would have little idea how to render “National Liberation Front” into Kabyle. The officially acceptable way of doing so relies on neologisms developed by activists and familiar mainly to other activists, despite the gradually expanding efforts of teachers and broadcasters – and such activists are especially unlikely to be members of the FLN, given its general reluctance to promote Tamazight. What everyone actually calls it in practice (in Kabyle and in Arabic alike) is “FLN”. I do absolutely agree with that! Lately, when I was in my fieldwork in Kabylia and Aures, the most frequent conversations I came across in my interviews where those of the preference of French over Arabic in all domains. When I asked whether this is a distancing strategy from Arabs or a closing one to France (politically speaking) everyone would feel anxious and simply say they do not like what Arabs like, and actually if there was any vote for a script preference for writing Tamazight, i would expect Latin to win over Arabic and even Tifinegh. Although it opens new ways for enriching and highlighting the uniqueness of Tamazight, Tifinegh does not offer the temptation provided by the Latin (the easiest and direct way with the least efforts). It seems that even if the majority claim it is a mere call for human and linguistic rights, there is a deep political direction in it. The latest book of Abdou elimam presents a new perception of looking at Algerian Arabic as a punic deviation rather than a variety of MSA and although the corpus provided is still small to prove thsi hypothesis, i would like to know your opinion about that. Abdou Elimam's hypothesis is completely unjustified. From what I've read of his work, he fails to find a single example of a word shared between Punic and Algerian Arabic but not Classical Arabic. Thanks for the answer, lameen. I had a similar opinion about Elimam's hypothesis and in a recent discussion with Clive Holes he rejected all his ideas too, based on the undeniable similarities Algerian Arabic have with all other Arabic varieties. As for the interviewees it was actually all limited to the working class (I relaise the social stratification in Algeria is highly debatable). The best jobs they had were being a teacher or a nurse, but even with their lack of proficiency in French they would highly stress its significance and instrumentality for the Berber movement. That's an interesting and somewhat surprising result (especially for the Aures). Do you have comparative data for non-Berber-speaking regions? Either way, I look forward to seeing how you analyse it. To be honest, I was not expecting that in Aures as well, but it seems like a new trend led by the new berber activists although I sensed a great challenge and disagreement with the Kabyle attitudes towars the whole issue of Tamazight. The old-fashioned slogans of the Algerian revolution and nationalism among these people are decreasing everyday as people come to realise they are marginalised whether supporting the Arabisation process or the Berber movement. Currently, I am just focusing on three regions that are all in Aures and Berber speaking actually, with different levels of contact with Arabs, but in my field I got lots of data also from non- berbers especially in Setif and Constantine. I am still in the very early stages of data anaysis and to be honest I am emphasizing more the social network between different berbers and Arabs to analyse such changes in attitudes, language use and preferences.I will definitely be glad to have your comments and criticism as soon as I finish.